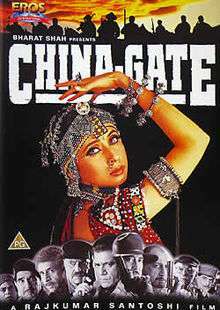 China Gate is a 1998 Bollywood film directed by Rajkumar Santoshi. It is a "humble tribute to the late Akira Kurosawa", crediting Seven Samurai (1954) as its inspiration and starred Samir Soni in his film debut. The film is famous for the song "Chamma Chamma", sung by Alka Yagnik, composed by Anu Malik, and featuring Urmila Matondkar dancing to it. The song was subsequently used in Baz Luhrmann's Hollywood musical film, Moulin Rouge! (2001). The role played by Mukesh Tiwari as cruel Jageera was well appreciated. The story begins with Col. Krishnakant and his ten men who were sacked from the Indian army as they failed in the China Gate mission. After witnessing the brutal slaying of her Forest Officer father, Sunder Rajan, at the hands of dreaded dacoit Jageera, Sandhya goes to Col. and asks for his assistance in bringing an end to Jageera's rule in the Devdurg region. Krishnakant agrees to assist her and summons ten of his fellow officers and subordinates to assist him in this mission. They assemble at Devdurg with the necessary ammunitions and arms to combat Jageera, not realizing that Jageera has influence over the local police detachment, who will prevent Krishnakant and his men to possess any guns and weapons. This does not deter the men, and they continue to stay on in Devdurg and gain the confidence of the villagers. What the villagers do not know that Krishnakant and his men had all been dishonorably discharged from the army for cowardice and retreating when attacked by the enemy. Urmila Matondkar .... Special Appearance in song "Chamma Chamma"
The film was received moderately by critics and people. In terms of collections, China Gate was declared an average grosser at the box office. However, it did a good business in Rajasthan.